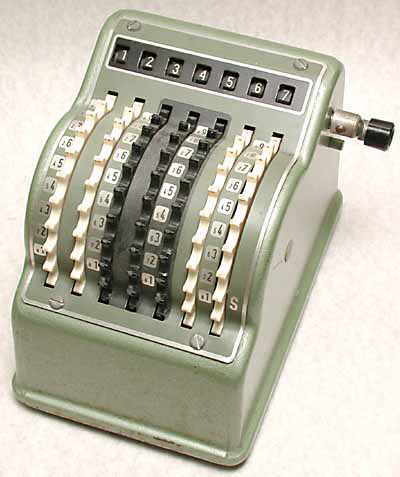 Disk calculator providing addition only by dialling the required number on the gear wheels using a finger. Turning the little crank on the right clears the accumulator to zero. These are a cheaper design than the Resulta type of disk calculator. The machine above is marked Bowler Countess and is a £sd Sterling currency model, whereas the machine shown below has no name or manufacturer and is a decimal version. This model marked "Foreign Made" was launched in Britain at the end of 1960, and was distributed by Bowler Products Ltd., of London. The price of the Bowler Countess was £10 10s Sterling [about US$28]. These are fairly sturdily made but low-cost adding machines. There were also many cheaper all-plastic machines.